The adoption and adaptation of freely available materials which may include OER and the curation of varied media such as videos and text. The openly licensed materials may also be modified or remixed to contextualize them for specific courses or students. The creation of OER, including high quality multimedia resources, open textbooks, and open problem sets, that are used by multiple UBC courses as well as by other institutions across the world. The development and delivery of Massive Open Online Courses (MOOCs) that anyone in the world can take. Additionally, UBC instructors often reuse their MOOC resources for credit courses. For example, instructors in UBC Computer Science have developed a series of online courses for an edX Software Development MicroMasters and have replaced paid, print textbooks in their UBC courses with rich multimedia learning materials, such as videos or problem sets, developed for the edX MOOCs. The adoption of open pedagogies and practices that leverage UBC’s open technologies, such as the UBC Wiki or UBC Blogs, to allow for flexible, authentic, and accessible learning. These practices often emphasize students as collaborators in the production of knowledge. For a full discussion of the types of open practices at UBC, please see past Open UBC Snapshots and the Open UBC Projects Directory. This snapshot specifically examines courses that have used openly or freely accessible resources in place of paid textbooks. It also includes resources that are free of cost and access barriers but do not include a permissive copyright license that would allow for the resources to be adapted, copied, or shared without direct permission of the copyright holder. At UBC such resources often take the form of custom course notes, MOOC materials, or textbooks and other learning resources that the instructor has created and posted publicly online but which do not include a stated permission for reuse and/or an open license, such as a Creative Commons license. For the purposes of this report, resources that are not publicly accessible were not included. Please see Appendix A for a sample of open resources used by courses at UBC. Please note: Open UBC Snapshots attempt to quantify and explore emerging trends in open educational practices at UBC. Last year’s report can be viewed here. Statistics and information in the Open UBC Snapshots are compiled by the Centre for Teaching, Learning and Technology (CTLT) with support and input from the broader UBC community. Numbers used in this report represent a snapshot of verified activities at UBC; however, a large portion of open educational practices happen independently and may not be accounted for in this snapshot. Please help us make this series more complete. If you are using open resources in your own teaching and learning or are aware of any open practices or adoptions on campus, please let us know! At UBC, a significant number of students are impacted by the use of open or freely available resources. In academic year 2018, an estimated 15,450 students took 39 courses or course sections that were using open or freely available resources in place of paid textbooks. This replacement of traditional textbooks with open resources has potentially saved UBC students an estimated at $1.5 to $2.3 million dollars this academic year. This range reflects alternative buying options available for students including new, used and rental textbooks and is based on the approach used by the BC Open Textbook project to estimate savings. The high end of the range is based on new textbook prices and course enrolments while low end value is calculated based on an average cost of $100 per student per textbook. For courses in which the replaced textbook cost less than $100, the lower amount was used for both the high and low range. Additionally, in courses where the original textbook cost is unknown, or if the instructor intentionally chose to use open textbooks when the course was created, a $100 per student cost savings has been used to calculate potential financial impacts. Since 2011, at least 198 UBC courses, or course sections have been identified as having used open textbooks, OERs, or freely accessible resources instead of paid textbooks. Across those seven years, 63,590 UBC students were enrolled in those courses using open resources. The estimated cost savings for students has also been significant. The replacement of traditional textbooks with open resources has potentially saved UBC students between $6.3 to $9. million since academic year 2011. 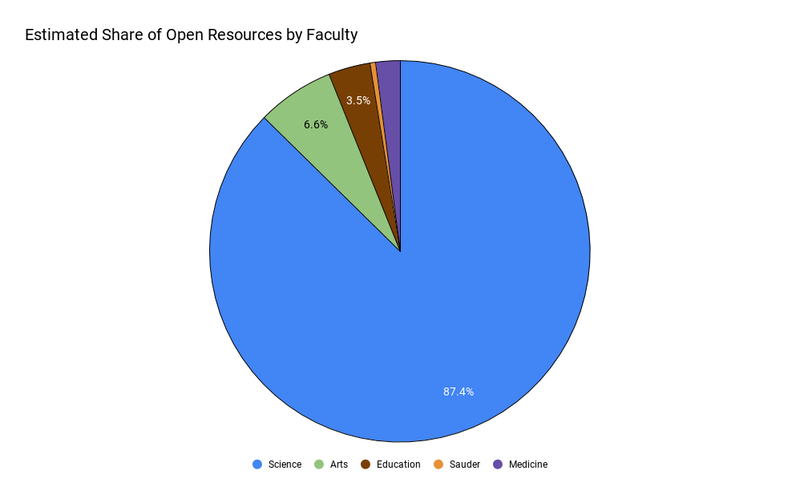 Instructors in the UBC Math and Computer Science departments continue to have the highest number of courses using open resources, and, as a result, the largest percentage of courses that are using open resources is within the Faculty of Science. High enrollment courses in the Faculty of Science that are using open resources represent a significant source of student savings. The Department of Computer Science’s investment in developing a wide range of resources to be used in both their edX Software Development MicroMasters as well as their credit courses is a significant source of cost savings for computer science students at UBC. These MOOC materials are now being used in four courses (CPSC 107, 110, 201, and 310). Likewise, the CLP Calculus Textbooks, which were written by UBC Mathematics Department faculty Joel Feldman, Andrew Rechnitzer and Elyse Yeager, is used in several high enrolment Math courses and represents the most widely used single open resource at UBC. In addition to open resources, open problem sets and open platforms are providing more opportunities for students to be assessed on their understanding. For example, in 2018 Winter Term 1, an estimated 40 UBC courses used WeBWork, an open source assignment and quiz application for mathematics and science that has an openly licensed problem library with over 30,000 reviewed questions. The use of paid textbooks or digital educational materials represents a common teaching practice in higher education. At UBC, according to the 2018 Teaching Practices Survey, 45 percent of instructors expect their students to purchase, rent, or borrow textbooks or other print or digital texts which is double the amount of instructors, 23 percent, that indicated they expect their students to use a digital or print textbook that is freely available (Han, Briseño-Garzón, & Biro, 2018). While the use of open or freely available educational resources continues to have widespread utilization and increasing support at UBC, the costs of course materials still represent a barrier to learning for students at UBC. According to the 2018 AMS Academic Experience Survey (AES), UBC-V undergraduates spent an average of $760 on textbooks or course resources in academic year 2017. Forty-four percent of these undergraduate students reported spending $500 or more while 17 percent reported spending $1000 or more (pg. 17). According to 2018 AES survey data, over 70 percent of UBC-V undergraduate students have gone without textbooks or resources due to cost at least once, with 34 percent of students reporting they frequently or often go without textbooks due to costs. Additionally, over 90 percent of UBC Vancouver undergraduates reported having bought textbook or resources and never used them, with 49 percent reporting that they frequently or often buy textbook or resources and never use them. 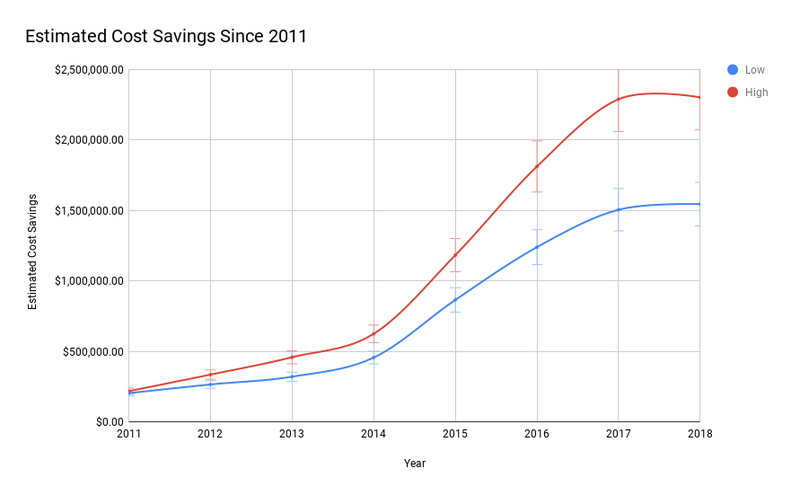 As the use of open resources increased at UBC, the associated use of paid textbooks and resources has also slightly decreased in the last three years. Indeed, the 2018 AES found that “eighty-six percent of students reported using open educational resources (OER) in lieu of a textbook, which suggests that the uptake of OERs at UBC has impacted a large number of students positively” (Pg 17). 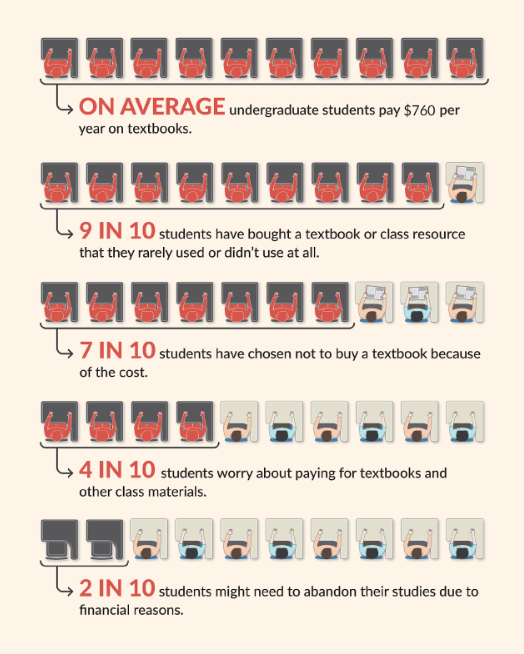 However, students still find themselves on the receiving end of increased costs of textbooks. According to the Canadian Federation of Students, textbook costs have risen by 2.44 times the rate of inflation since 2008. Likewise, according to the U.S. Bureau of Labor Statistics, textbook prices have increased by 88 percent in the past decade, compared to a 63 percent increase in U.S. college tuition and fees. The use of open resources is having a strong impact on the cost of education for UBC students. Research into the use of open educational materials has shown that they also can have positive benefits on the student experience. Hendricks, Reinsberg and Rieger (2017) examined the use of an open textbook in Physics 100 (PHYS 100) and found 94 percent of the students indicated that the fact the textbook was customized to their course was an important feature of the open textbook. In PHYS100, 94 percent of students indicated that the fact the open textbook was customized to their course was an important feature. Additionally, 93 percent of the students respondents in the course indicated that the quality of the open textbook was the same or better than textbooks in their other courses. The researchers also found that final exam scores and grade distributions remained the same after the open textbook adoption as they had been before. 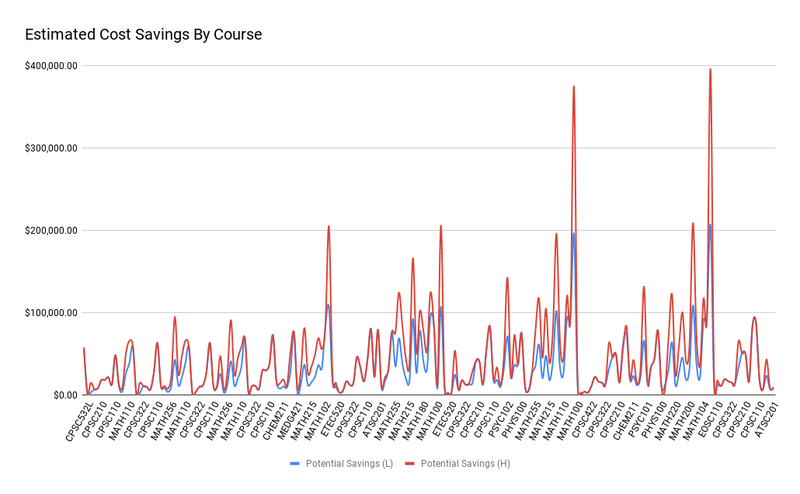 By adopting an open resources, the instructors estimated that they had saved students approximately $85,000 that year. Over 92 percent of student respondents indicated that the fact the textbook was free of cost was an important feature of the text; additionally 86 percent of students also indicated that the fact that the text could be accessed anywhere was also an important feature. “students generally achieve the same learning outcomes when OER are utilized and simultaneously save significant amounts of money. Studies across a variety of settings indicate that both students and faculty are generally positive regarding OER” (Hilton, 2016). Instructors using open textbooks in Academic Year 2018 have reported similar satisfaction from students. For example, Dr. Azim Shariff informally surveyed the 225 students in his section of PSYC 102 and found that over 81 percent of students indicated that they preferred the open materials from the Noba Project that had been adopted for in the course rather than a paid, physical textbook. A recent large scale study at the University of Georgia by Colvard, Watson & Park (2018) indicates that the benefits of adopting open resources goes beyond affordability. The study compared the before and after historical student academic performance data of eight different undergraduate courses involving 21,822 students that had adopted open textbooks. The researchers found that after the open textbook adoptions, there was a 5.50 percent increase in A grades, a 7.73 percent increase for A- grades, and an 1.14 percent increase for B+ grades in the courses. The drop, fail, or withdraw rate additionally decreased by 2.68% for all students enrolled in the respective courses. Although open resources are free of access costs, integrating them into effective teaching practices often include “development costs” that are usually paid by individual faculty in terms of time and efforts. According to Jhangiani, Pitt, Hendricks, Key, and Lalonde key barriers to the use OER by post-secondary faculty across British Columbia, including UBC, involve difficulty finding OER in their subject area, not having enough time to look for relevant and higher quality resources, not having enough time to experiment with OER in the classroom, and difficulty with technology (2016). Theme One: Inclusion: “Led by strong student advocacy efforts, UBC is expanding the use of open textbooks to improve affordability. As of 2016, the creation and dissemination of open educational resources is recognized as an example of Educational Leadership activity in consideration for appointment, promotion and tenure decisions. UBC has also launched a diverse set of high demand public online offerings (massive open online course or MOOCS), including Reconciliation through Indigenous Education, How to Write a Novel , Climate Change:The Science, and Introduction to Marketing. The Library’s Open Collections contains over 200,000 publicly available digital objects. UBC is committed to making education more affordable and accessible, with expanded creation and dissemination of open educational resources” (pg 21). Core Area One: People and Places: “Our virtual places are expanding rapidly to include online class discussions, internet-hosted open educational resources created by UBC faculty, and conference links that connect our various sites in collaborative research and learning” (pg. 38). Strategy 1: Great People: “To help address affordability pressures, we will expand financial assistance programs for students including funding and support for continued growth in open educational resources” (pg. 41). The Alma Mater Society (AMS), UBC’s undergraduate student society, continues to show leadership within the UBC community in advocating for the use of open resources. The AMS #TextbookBroke campaign, which engaged over 1,000 students this past year on the topic of textbook affordability, continues to advocate for “campus-wide uptake of OERs to ensure students aren’t forced to either suffer financially or do without course-required textbooks at the expense of their learning” (AMS, n.d.). As part of the textbook broke campaign, AMS has recognized faculty champions of OER as well as encouraged the use of course evaluations as a possible way to inform instructors about the cost impacts of resources for learning and the possibility for OER as alternative approaches. In addition to affordability, the AMS has also recognized the benefits that openly licensed and shared resources have within pedagogy: “…because anyone can edit and distribute open resources, faculty can involve students in the creation and dissemination of knowledge for greater audiences and champion the non-disposable assignment” (AMS, n.d.). Evidence of educational leadership is required for tenure/promotion in the Educational Leadership stream…. It can include, but is not limited to…[c]ontributions to the practice and theory of teaching and learning literature, including publications in peer-reviewed and professional journals, conference publications, book chapters, textbooks and open education repositories/resources (pg 16). According to a 2018 article in Educause Review, UBC is “is paving the way for other institutions and demonstrating a strong commitment to open education. Among the informal scholarly culture of teaching and learning, junior faculty will hopefully now be encouraged to explore open educational practices and senior colleagues may look for this type of evidence when assessing the quality and impact of others’ teaching” (Yano, Munro, & Coolidge, 2018). UBC-Vancouver’s Teaching and Learning Enhancement Fund (TLEF) was created in 1991 to enrich student learning by supporting innovative and effective educational enhancements. Starting in the 2017/2018 cycle, a priority focus on the development or integration of open educational resources (OER) was added to the criteria for new proposals. Furthermore, eligibility requirements were also added that specifically stated that funded projects are encouraged to openly license their developed materials under an appropriate Creative Commons license to allow for broad sharing within and beyond UBC. Approximately 25 percent of the 2017/2018 TLEF funded projects had an explicit open strategy. In the 2018/2019 cycle, more than 39 percent of the TLEF funded projects incorporated strategies around open resources or practices. For a broader discussion of TLEF funds supporting Open Education, please see the 2018 Open UBC Snapshot on TLEFs. In 2018, UBC also held a number of events and sessions for faculty, students and staff to promote and increase capacity for open educational practices. These sessions included a full day series of workshops to support open scholarship and practices, student facing open learning analytics hackathons, and joint institutional events for international Open Access and Open Education weeks. From October 2017 to October 2018, 243 students, faculty and staff (236 unique people) attended CTLT events focused on different aspects of open education. The Open UBC website, a curated collection of resources for UBC faculty and students to learn about open education practices, had more than 21,000 unique page views in that same time period. Instructors who use paid textbooks or digital materials continue to cite the ability to provide ancillary resources such as quiz or problem banks, and to access robust learning analytics on textbook publishers’ digital platforms in order to gain insight into student engagement and performance as important factors in their learning material choices. According to the 2018 UBC Teaching Practices Survey, 12 percent of instructors ask students to purchase access to digital learning resources other than a textbook (e.g. interactive modules, virtual simulations, online tools, etc). Support and investments for open resources beyond textbooks will continue to be important. In the coming academic year, there will be increasing focus on how open platforms, like WeBWork, can be leveraged to provide student access to ancillary resources required for assessment. The alignment of of open education with open scholarship, such as open data, open science, and open access publishing. The use of APIs to provide transparency, access, and new opportunities for students around learning analytics, learning technologies, and personal data. Increased funding and support for OER for individual faculty as well as departments. Open practices and resources are enabling faculty, staff and students at UBC and beyond to reduce barriers and improve teaching and learning. If you are interested in finding or sharing more information about open educational resources or open practices at UBC, please see the resources section at open.ubc.ca or contact us. Lucas Wright and Jonathan Aiello helped with researching this Open UBC Snapshot. 2018 Winter Term 1 PHYS117 439 OpenStax: University Physics Vol 1.